Outgoing postcard US-3169529 to Russia was a vintage card showing Paul Manship's majestic bronze gilded statue of the Greek legend of the Titan Prometheus recumbent, bringing fire to mankind from the sun. 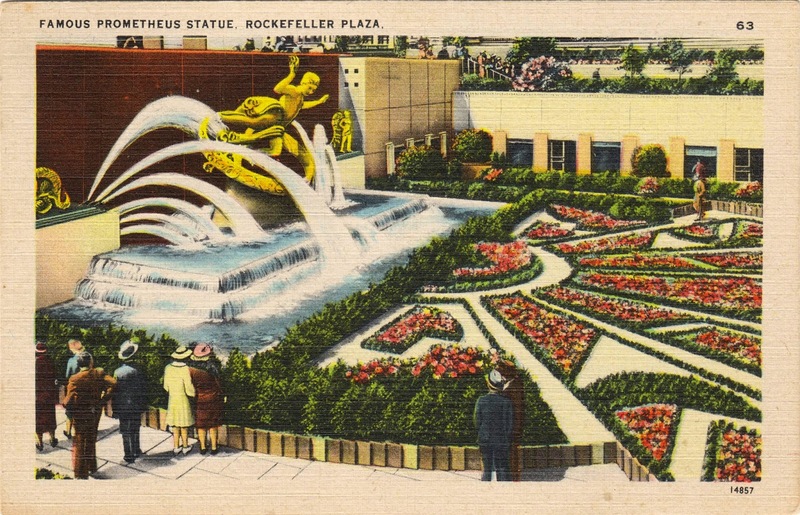 Built in 1934, the 5.5-meter or 18-foot tall and 8-ton statue is a focal point of the fountain in the sunken gardens, which are noted for their trees and shrubs and flowers, at the front of 30 Rockefeller Plaza. The model for Prometheus was Leonardo (Leon) Nole. The inscription on the granite wall behind was a paraphrase from Aeschylus that reads: "Prometheus, teacher in every art, brought the fire that hath proved to mortals a means to mighty ends." Built by the Rockefeller family, Rockefeller Center is a complex of 19 commercial buildings covering 22 acres or 89,000 square meters panning the area from Fifth Avenue to Sixth Avenue and between 48th and 51st streets in the center of Midtown Manhattan, New York City, New York. It was recognized as a National Historic Landmark in 1987.